What to Engrave in my Wedding Band? This is a big decision. Imagine having access to a list of serious and fun wording for your wedding bands. Now you have a source to all sorts of ideas. Spend an evening with your fiancee over some popcorn and go over the list. Of course, we want you to bring your wedding bands to us for engraving. You will find we have way more engraving font choices and we can even engrave symbols on your wedding bands. The best part - we have a much faster turn around time for engraving your rings. Why Use A Unity Sand Ceremony Set? Unity Candles can blow out. Some non-church places don't allow lit candles. Maybe it's a second marriage and you want to have the children a part of the ceremony. What do you do? You want to make your wedding extra special to you, your family and your friends. here are some great ideas to personalize your wedding. 1. Have your champagne bottle etched. We etch the couples first names on the bottle with the wedding date underneath. We then color fill in the etching with a gold or silver fill to match the label. 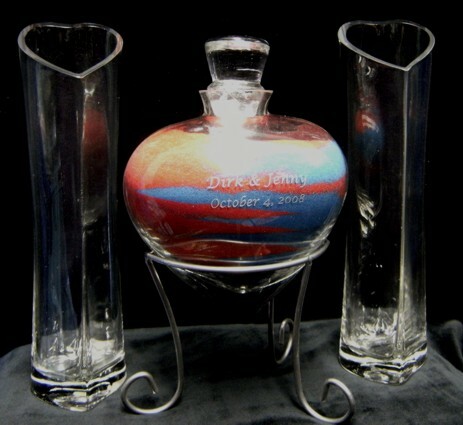 Some couples will have a second bottle etched for the 5th or 10th anniversary. Make your wedding special with an etched chanpagne bottle. 2. Have your cake server engraved with the couples first names and wedding date. Many couples will hold onto the cake server so when their children get married, they can use it again and the new names. 4. You know your are going to have some special pictures that you want to highlight in your new home. An engraved frame with your names and wedding date will be in a place of honor in your home. 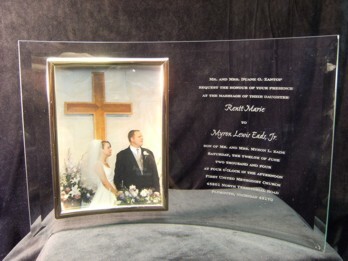 We also have a curved glass frame where we can reproduce your wedding invitation along with your wedding photo. This makes this a special gift for your parents. What to give the people standing up in your wedding? Don't forget the Flower Girl and the Ring Bearer. We have some great ideas for them.